Good genealogy research means paying attention to detail. But is it possible to try to be "too" perfect? You can listen to this episode by clicking the play button below. You can also listen on Apple Podcasts, Google Podcasts, Stitcher, and most other podcast apps. I am not advocating doing bad research. I'm not saying that we should just flip a coin when we have conflicting sources. What I'm talking about is how our sense of getting everything perfect hurts our research efforts. One of the most hotly debated topics in genealogy is whether or not to have a public online tree. One of the most common reasons that I hear people say for not having a public online tree is, "My tree isn't good enough. My tree has mistakes in it." Yes, your tree has mistakes in it, and you know what? So does my tree. Everybody's genealogy has mistakes. It could be that you have assigned the wrong parents to someone. You might have missed a spouse. Maybe you missed a child who died in infancy. Maybe you have a marriage date wrong. All of us have something wrong with our trees. (We are human and humans make mistakes.) If the thought of mistakes is the only reason that you're not putting your information out there to connect with others, I would encourage you to rethink that. Having an online tree is a great way to connect with others researching the same line. Of course, there are times when we know that the tree we have is in bad shape. Let's say that you have a line of the family that you're really having a hard time sorting everybody out. You actually can have two different trees. You can have a public tree where you have the things that you're confident in, but then you have another tree that's just for your research purposes. When you reach a conclusion that you're confident in, then you can copy that information over into your public tree. It's like having the best of both worlds. 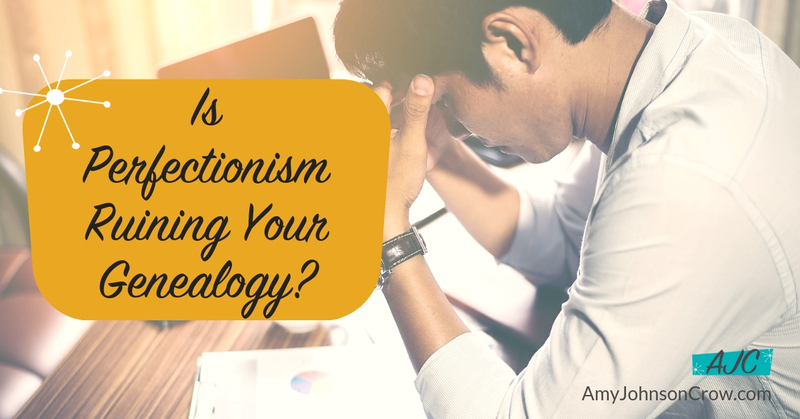 Perfectionism can also prevent us from actually doing something with our research. 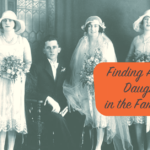 I have served as the editor of several genealogy publications and something that I would hear fairly frequently from people that I would approach about doing an article was, "I don't know enough about that ancestor." Somehow we think that we have to know absolutely everything before we publish something, whether it's an article, a book, or a blog post. Nothing could be further from the truth. For one thing, the process of writing can actually be a great way to analyze your research. It makes you look at what you have and where the gaps are in your research. You can spot consistencies in your logic. Trying to be "perfect" can prevent us from using an incredible research tool. I see this frequently with regard to source citations. Yes, you do need to cite your sources, but don't get hung up on the format. Become familiar with what the elements of a good source citation are, such as the title, the author/creator and the work, when it was published/created, etc. 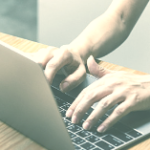 Once you become familiar with the elements of a good source citation, you can go ahead and record those elements and worry about the commas and semi-colons later. This last aspect of perfectionism literally could be ruining your genealogy and that is when it comes to preservation. I hear the question all the time: What is the right way to organize my materials? What is the right way for me to preserve what I have? So often we get hung up on what is the absolute correct, most perfect way to do something and we end up not doing anything. If we don't do something to preserve our genealogy, it's not going to last. I mentioned organization as part of this because we do need to consider organization as part of our methods of preserving our research. If we just have piles of papers, well our descendants aren't going to know what to do with it. We need to take the time to get those materials into some sort of organized fashion. "Organize Your Digital Files: Tips from Genealogy Guy Drew Smith"
"Organize Your Genealogy: Tips from Professional Organizer Janine Adams"
We all want to do a good job with our genealogy research. 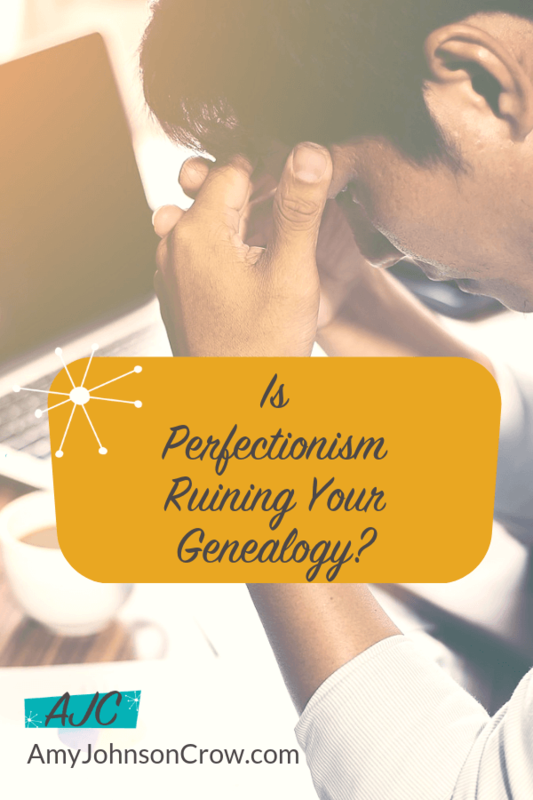 But when we think that nothing less than perfect will do, we end up losing out on some of the benefits of genealogy: making connections, sharing with others, and preserving our work for the future. This entry was posted in Podcast, Preservation and tagged Generations Cafe, perfectionism, source citations by Amy Johnson Crow. Bookmark the permalink. I really enjoyed this episode. You hit the nail on the head for me regarding wanting your research to be perfect. Very easy to listen to and the notes are to the point. Thank you for the time you have put into this presentation. Thank You! I needed this. I get so up tight sometimes trying to source everything. I try to source but sometimes there is no source to be found. Sometimes I make an estimated date of birth just to help me in my search for that person, now I make a note to that effect so if I come back to it, I will know that the DOB was an estimate and that is why it is not sourced. I look forward to the next episode! Thank you for the podcast. My first podcast listening experience. I suspect that I should have listened to it using the podcast icon on my iPad, but didn’t work. So listended by clicking on the link from your newsletter to your web page. Enjoyed your point of view on perfectionism. Started out wanting to make a photo book for the family and use photos and genealogy notes that my Dad left me. His notes go back to the 1600s in England. It’s been very discouraging to figure out the English connections and so have thought I wouldn’t try to document back. Your podcast made me think that perhaps what I need to do is create a public Family tree and hope for some input? Again, thank you so much for your dedication to teaching and encouraging your students along the way. Thank you! I tell to my students all the time. Imho, this is a fault of BCG and NQS. When an article has more space taken up by footnotes than story, it scares my students. Genealogy has lost a lot of the fun while a handful of people push to make it look like Scientific American. Chill people. Many sources I meticulously cited are no good…that DB contract expired and the source is no longer where I found it, the library culled the book, or the historical society folded, etc. Thank you for this podcast! I have started my family tree over several times because I am always so worried that I have something incorrect in my tree. My current tree is as perfect as I can get it, but I know it has errors., and it isn’t even the one I have public! So maybe I will go back and make this my public tree and see if others can fill in the blanks! Thank you again. I look forward to hearing more! I have a family to review. I believe it’s all messed up! Thank you for this informative podcast. This is the second podcast of yours that I have listened to and I really have enjoyed them. I think they are useful for genealogists of all levels. 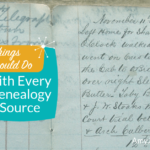 They are especially good for beginners, but experienced genealogists will find them as helpful reminders of what good genealogy research consists of. You talked about citations briefly; I used to get hung up on creating a perfect citation and it can be a little frustrating if you allow it to be such. I attended Nancy Loe’s session at last year’s RootsTech about using archiving principles in organizing. It was a great session and she has a great, little, inexpensive books at her website [sassyjanegenealogy.com] on organization. I would recommend it to anyone. But I also found another of her short books dealing with citations. It was most useful and I would recommend it also especially if you are frustrated by citation creation. I love your podcasts and look very forward to more! Nice podcast, Amy! It’s the first one I’ve ever listened to because, you know, it’s something new for me. Now I see that somehow I’m commenting from my blog site, if you care to take a look. The blog was something I was inspired to do when I decided to take your 52 ancestors in 52 week’s challenge. The challenge made me really focus on fleshing out some ancestors I’d neglected. I love how you are constantly coming up with new ideas. Keep up the good work.! DEFINITELY the nudge I needed to move forward to a public tree–really enjoyed your podcast! Love the podcast and particularly love this episode, since I’m all about letting go of perfectionism. Congrats on a great addition to the genealogy learning space! I’ve collected and compiled for 30+ years and have so many family stories in my head and this podcast has inspired me to start sharing those stories. Thank you. Thanks Amy. Hope this is the push I need to add info to my public tree on Ancestry and My Heritage. I’m sure there are many errors in both but also some info probably no longer available….I’ve been researching for over 55 years but now homebound so time to make more sense of all of it. Thanks for the push and I really enjoyed the article. Thanks again. no website currently but maybe start a new one, long overdue. Good post. I think it sort of speaks to a paradox I’ve observed that exist in the genealogy ecosystem in general. On one hand a researcher wants a well sourced and documented tree. That requires the researcher to demonstrate good judgement competencies. On the other hand, those same judgement competencies taken to the extreme can result in a researcher demonstrating the perfectionism behaviors you discuss and it can also lead to a researcher being prickly towards another researcher they may perceive as less competent than them, same behavior can lead to a researcher hoarding research, not sharing with others, etc. I think its important researchers are aware of how their judgement competencies can be both strengths and saboteurs. Maybe what I should do is publish my brick wall Daniel D. Ward’s story and magically the lead I need will appear almost instantly. Isn’t that how stuff usually happens? Amy, I just discovered your Generations Cafe podcasts and love them! I like that they are only 15 – 20 minutes, I can listen while in the car. I’ve listened to 3 so far and the topics are great. I’ve shared them on our Tips page of our website for our members. Keep them coming! Thanks for the kind words, Rosa! I’m glad you’re enjoying the podcast. Thank you for helping spread the word! Thank you, Georgia! I’m glad it was helpful. I quickly read this and did not listen to the podcast. One thing I get (occasionally) chided for is that in my source citations for census records, i am still using the old format from ESM’s first Evidence book. I will not put websites into the census citations, because I know that there is a high likelihood of that site URL changing. They are, however, still at NARA. I use that format. Guess what? People will still find them. That’s what is important to me. Honestly, I usually leave off the website when I’m citing a census, too.